Suitable for Key Stage 1 or Key Stage 2 Up in the Gallery focuses on a timetable typical of the Victorian period around 1845 for an infant class. Their visit takes place in the restored schoolroom and playground designed by Samuel Wilderspin who taught there with his wife and daughter. The “teacher” Mrs Wilderspin recreates the lessons making use of the gallery and teaching posts. The lessons are based on arithmetic, reading, science, RE, singing and include drill sessions. Playtime takes place in the playground using typical toys from the time including a Victorian swing. 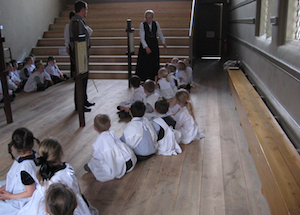 An opportunity is then given for the children to compare and contrast the schoolroom of 1845 with their modern classroom. There is a booking fee of £3.50 per child with a minimum charge of £60. or £3 per pupil when two sessions are booked as part of a whole-day visit. Maximum group size 35. Pre-visits are encouraged to discuss the learning programmes and arrangements for a school visit. These can be scheduled at the end of a school day – please call to make arrangements.